SilverCrest Metals Inc. (“SilverCrest” or the “Company”) is pleased to announce additional Phase II drill results for the Las Chispas Property (the “Property”) located in Sonora, Mexico. Step-out drilling targeting extensions of the Babicanora Vein continues to intersect high-grade mineralization. With the latest results, SilverCrest has drill-tested and intersected high-grade mineralization for an additional 400 metre of strike length at the Babicanora Vein. SilverCrest Metals Inc. (“SilverCrest” or the “Company”) is pleased to announce additional Phase II drill results for the Las Chispas Property (the “Property”) located in Sonora, Mexico. Step-out drilling targeting extensions of the Babicanora Vein continues to intersect high-grade mineralization. With the latest results, SilverCrest has drill-tested and intersected high-grade mineralization for an additional 400 metre of strike length at the Babicanora Vein. The high-grade footprint is now a total of 1,000 metres in strike length, with a near-surface mineralized height of 125 to 175 metres (see attached Figures). There are 19 known epithermal veins on the Property, including nine which consist of the Babicanora, Babicanora Footwall, Las Chispas, Giovanni, La Blanquita, William Tell, Varela, Granaditas and Amethyst veins. SilverCrest has intersected high-grade silver-gold mineralization in each of the nine veins drilled to date. SilverCrest Metals Babicanora Long Sections Nov 27 2017Long Section (Inclined) of Babicanora Vein Las Chispas Property, Looking Southwest, Long Section (Inclined) of Babicanora Vein Looking Southwest (Insert 1), Long Section (Inclined) of Babicanora Vein Looking Southwest (Insert 2), Las Chispas District & Babicanora Plan Map. 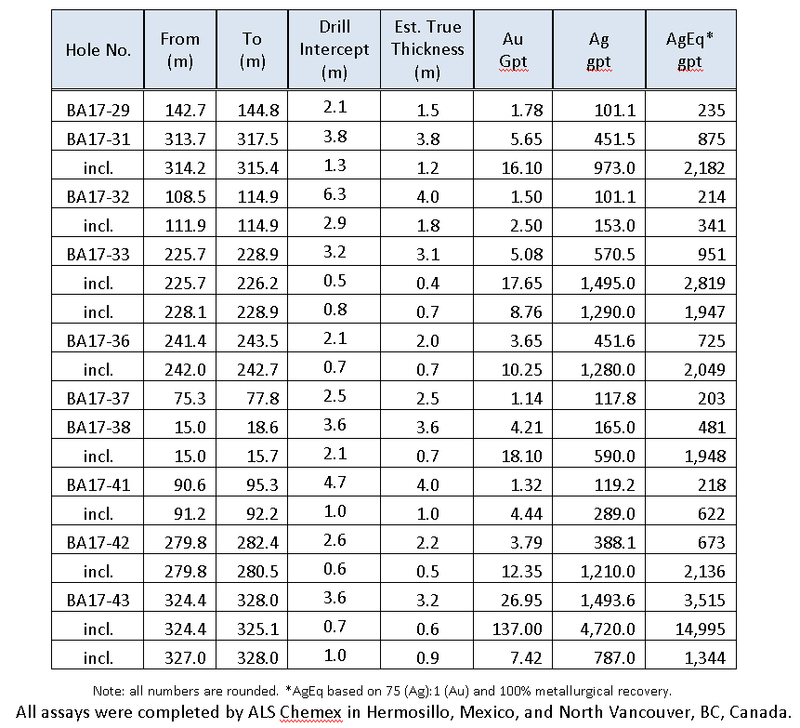 SilverCrest Expands Babicanora High-Grade Footprint - Table Nov-27-17SilverCrest Metals Las Chispas Project, Sonora Mexico, Babicanora Vein, selection of recent intercepts.